The time for battle is now! Monsters tumble out of the dark, wicked drow hatch vile plots, demons eager to invade the Material Plane clamor at the edges of reality, and bizarre aberrations pursue mad agendas that will plunge the world and all the planes into chaos. The people need champions to throw back the darkness, to take the fight to the dread enemies, and thwart their evil designs. While adventurers of all kinds answer the call to battle, from courageous fighters to cunning rogues, fell wizards and wise clerics, they aren’t the only ones capable of taking a brave stand. Joining them is a new breed of warrior: those brilliant tacticians and inspiring leaders known as warlords. These battle-hardened champions lead the charge into combat and through their insights, tricks, and stratagems, they enable all who fight at their sides to achieve their full potential and triumph in the face of any adversity. 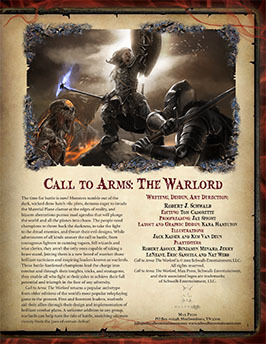 Call to Arms: The Warlord returns a popular archetype from older editions of the world’s most popular roleplaying game to the present. First and foremost leaders, warlords aid their allies through their design and implementation of brilliant combat plans. A welcome addition to any group, warlords can help turn the tide of battle, snatching ultimate victory from the jaws of certain defeat! Pick up your copy in PDF from Schwalb Entertainment or DriveThruRPG! Wizards stand apart from other magic-users in how they acquire arcane knowledge. Rather than drawing on inborn talent or making some fell bargain with an otherworldly power, wizards discover magic through research and study. They delve into ancient tomes and riffle through crumbling scrolls, committing to memory all that they have learned. Their methods reward them with incredible versatility but also tempt them to peer into dark places, to learn and master the most secret arts, for there lies true and lasting power, even if its knowledge damns their souls. 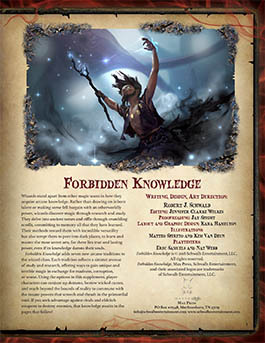 Forbidden Knowledge adds seven new arcane traditions to the wizard class. Each tradition reflects a sinister avenue of study and research, offering ways to gain unique and terrible magic in exchange for madness, corruption, or worse. Using the options in this supplement, player characters can conjure up demons, bestow wicked curses, and reach beyond the bounds of reality to commune with the insane powers that screech and thrash in the primordial void. If you seek advantage against rivals and eldritch weapons to destroy enemies, that knowledge awaits you! Pick up Forbidden Knowledge in PDF today at Schwalb Entertainment or DriveThruRPG today! 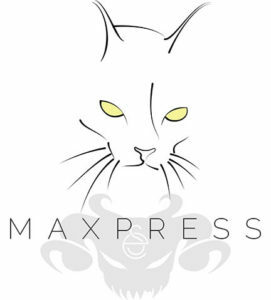 Some of the greatest and most feared figures in the history of the multiverse earned their reputations or positions by mastering the secrets of magic. From the crazed wizard who built three high towers and sealed demon lords in the dungeons below them, to the accursed mage who descended into the Abyss to confront the Queen of Dragons, to the chosen mage of the Goddess of Magic, whose influence has helped shape entire realms, these figures all command power unmatched by other mortals. Magic makes of them gods when compared to the mundane peoples. And although many such beings have earned esteem for their good works and heroic exploits, others have surrendered to their base desires and used their superhuman magical abilities for selfish ends. 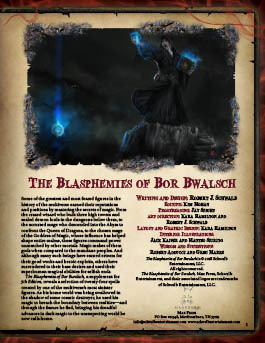 The Blasphemies of Bor Bwalsch, a supplement for 5th Edition from Max Press, reveals a selection of 24 spells created by one of the multiverse’s most sinister figures. As his native realm was being swallowed in the shadow of some cosmic destroyer, he used his magic to breach the boundary between realities—and through the fissure he fled, bringing his dreadful advances in dark magic to the unsuspecting world he now calls home. Grab a PDF today on Schwalb Entertainment or from our partners at DriveThruRPG!